Advanced stats are not perfect and are mostly useless as evaluators of talent (like pretty much any other stat) without context, and the bigger the sample size the more accurate a stat will become-ideally, for hockey, this means at least an 82 game season. I understand some people might have issues when we bring up things like PDO, GVT, CorsiREL and other non-traditional ways of evaluation. In my opinion, these stats add to the game, and I don't want someone to be lost when they read an article here because they don't know what the hell Zone Start is or how it impacts a player's stature. By no means am I an expert when it comes to these things: I, too, still have a lot to learn. These are my interpretations; if I have something wrong please bring it up and I'll edit the article accordingly. With those things in mind, I present to you part three in a glossary of advanced stat terminology. That means if Ryan Howse had played at the NHL level last year, we probably could've expected 29 or so points from him. Now, the obvious caveat here is that NHLE uses counting numbers for the majority of its calculation and it can't really take into account a player's opposition or situation. Also, we don't know how much a player's deficiencies would impact his NHL game-especially when you're dealing with kids in Major Junior. Someone who might skate well enough at the WHL level to put up 70 points will not score 25 in the NHL without improving his skating to at least an AHL level. 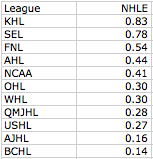 Still, I find NHLE to be a fun and effective tool for comparison. PDO: PDO is a stat created by Vic Ferrari. It is, simply put, a measure of how lucky a player is. That might be an odd concept, as by definition, luck is unpredictable and not quantifiable, but we use PDO as a proxy for it. PDO is made up of two things-EVSV% (the save percentage of the goalies while the player is on the ice at even strength) and EVSH% (the scoring percentage of the player at even strength the SH% of he and his linemates while he on ice at even strength). The average PDO in the NHL is 1000-a player with a PDO lower then 1000 can be expected to improve his EVSV% and EVSH% over time and a player with a PDO higher then 1000 can expect his EVSV% and EVSH% to get worse over time (this is a concept called progression/regression to the mean, depending on what side of "even" you're on). Now, the use of the number 1000 can be a bit confusing as we usually see SV% as a three number decimal and SH% as a three digit percentage. For PDO, we just use a three digit decimal for both. Let's look at Brendan Morrison's season last year for an example. Morrison got a ton of help from his goalies at EV last year-he had the 2nd highest EVSV% on the team, almost 10 points higher then a replacement goaltender (which, as I've demonstrated, is what the Flames had last year). Couple that with a 10% SH% and you get a PDO way above average. Now, it's possible he would've regressed along with the rest of the team in the last 20 games and finished with an average PDO, but when you compare his PDO to league average players (and I'm fully comfortable in saying he is a average player at this point in his career) he was a ton luckier then most of his cohorts. Now, those 27 points aren't actually worth much in terms of goals (only about 3 goals) but that's an entire half a win more then normal (a win in the NHL is accepted to be worth about 6 goals), which is a huge amount. Both of these stats can be used for predicting future performance and used in a comparative sense. NHLE doesn't tell us much at first glance, but it can be used as an excellent comparative tool between players (usually forwards) in different leagues. PDO is a good way to see if a player's success/failure is sustainable over a long period of time. They're fun stats to tinker around with.